Jonah Peretti powerfully answers his own headline question. Jennifer Lawrence is going to love this. 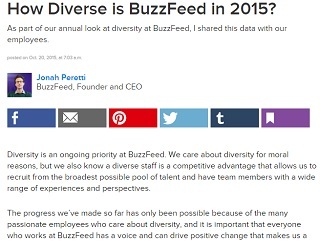 BuzzFeed founder Jonah Peretti has publicly shared some internal data about his employee ranks. As we all know, BuzzFeed is a global company, and when all outposts are taken into consideration, 52 percent of BuzzFeed managers are female and 48 percent tally as male. Coincidentally, this is also pretty much how the overall employee ranks break down at the company, gender wise. On the tech employee side, per the graph above, it’s more of a man’s world with male BuzzFeed staffers outnumbering female ones 3-to-1. But notice the Editorial and Sales & Marketing breakdowns – there, women outdistance men by an even larger margin than at the managerial (Admin) level.